There is nothing better than a basket of salty, crunchy fries covered in ketchup and mustard! Or maybe you prefer your fries without all the salt and the ketchup. Maybe you even prefer them as chili cheese fries instead. Whatever your fry preference, be sure to check out these 10 amazing places for French fries in Indiana! Visitors to the Brugge Brassiere in Indianapolis are in treat for a treat! The family-friendly Belgian joint serves up some of the most delicious “frites” one has ever had. 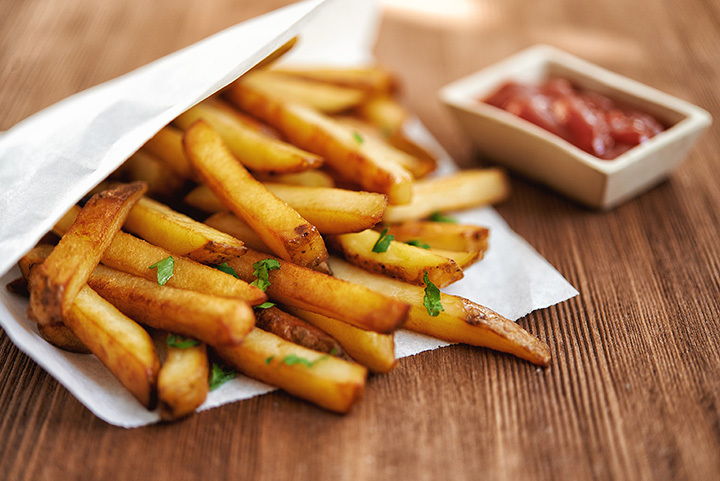 Their French fries, also known as “frites” are some of the most soft and crispy fries in Indiana. The perfect French fry. Whether you order them with another dish or have a meal consisting solely of frites, you won’t be disappointed! Be sure to order one of their sauces to go along with your frites! Choose from fresh mayonnaise, hot curry, homemade ketchup, sweet chili, sea salt and sherry vinegar, or fresh herb pesto! All are equally delicious. The Burgerhaus is a small business venture created by a dynamic duo: father and son Jon and Evan Costas. Bringing exotic flavors from around the world to the Hoosier community is what the Burgerhaus is all about. It’s also about the fries because what is a good burger without some equally tasty fries? Choose from Sweet Potato fries to spicy blue cheese, Cajun, garlic parmesan truffle oil or the famous Machu Picchu chili cheese fries! And in case the fries aren’t enough to lure you in, in 2014, Jon and Evan began a partnership with Kids Alive, International for “Full Belly Full Heart.” For every burger sold, they provide a balanced meal to a hungry child living in third world poverty. So far, they’ve provided over 500,000 meals! Ziffles Rib Bar in northern Fort Wayne, Indiana, is a family affair, and has been serving some of the most delectable fries in the Fort Wayne area since 1987. In case you were wondering just how popular their fries are, they go through 2,000 pounds of potatoes weekly! Everything is made from scratch and ready to order. Choose from their hand cut, house seasoned fries or if you’re feeling the munchies, try a basket of Ziff’s Cheezy Fries, which are homemade and loaded with cheddar and mozzarella cheese. Cheese and fries…yum! Union 50 is that cool place in Indianapolis, Indiana, where the must is live, the cocktails are handcrafted, the beer is local, and they have a huge selection of fine wine and whiskey. But it’s their fries with those drinks that keep the customers coming back. The fries are hand-cut, and come in four different styles: truffle oil, sea salt and parsley, manchego and bacon, or duck fat and rosemary. And with those four styles come five different sauces, of which you can choose two: house ketchup, garlic truffle aioli, espresso-chipotle barbecue, spicy grain mustard, or beer cheese. At Farm-Bloomington in southern Bloomington, Indiana, it’s all about fresh, local ingredients, from the bread for the pizza to the potatoes used to make the fries! Start your meal off with their FarmFamous Garlic Fries, featuring parmesan, garlic, herbs, chili flakes, lemon zest and turmeric aioli, or the regular Farmhouse Fries, with just a hint of salt and pepper and their famous tailgate chipotle ketchup. Both are equally delicious! Located in the heart of downtown Kokomo is the ever-popular Cook McDoogal’s Irish Pub. Step inside and find yourselves surrounded with rich hardwoods and beautiful glass work as Irish music plays in the background. You’ll feel as though you’ve left Indiana and temporarily gone to Ireland. Enjoy over 60 different beers with dozens of American and Irish dishes. Try an order of the Cooks Blagged French Fries with cheese sauce, bacon and scallions or a regular order of fries with your meal. You won’t be disappointed! Featuring Aristan American Pub Food, craft made cocktails and respectable beer and wine selections is Digby’s in downtown Lafayette, Indiana. It’s a historical feature, named after the man who bought the entire town of Lafayette back in 1824. Take your pick of fries, from their regular fries to the sweet potato fries. Each are cooked to precision, crispy yet soft and with just the right amount of seasonings. People from all over northwestern Indiana have been coming to Holly’s Restaurant and Pub since it first opened in 1974. It’s a casual, family owned and operated place and was voted Reader’s Choice Award Winner in 2017. They serve traditional American cuisine with select Mexican and barbecue favorites. Enjoy an assortment of fries, such as waffle fries, sweet potato fries, regular fries or for something unique, try their crispy green bean fries, which are snap green beans fried to perfection and served with chipotle ranch sauce! Tastee Top Grill in Cedar Lake, Indiana, is the place where everybody knows your name. It’s the place where families and friends come together to eat. Burgers, fries, hot dogs…did we mention French fries? Tastee’s has some of the best fries, cheese fries and chili cheese fries in all of Cedar Lake. Crisp to perfection, the perfect crunch with each bite! The mission of Meatheads Burgers is simple: fresh, all natural, and made to order. Where customers are treated like regulars with quality, friendly service. It’s also one of the best places in Munster, Indiana, to get French fries! Fresh cut daily, original or Cajun flavored, and you can order them as chili cheese fries or bacon cheese fries! Be sure to order them with a side of cheese, chili, or one of their signature dipping sauces: bacon ranch, barbecue, bleu cheese, buffalo, cucumber wasabi (refreshing, yet spicy), and more!